Charlie St. Clair's wealthy parents are ready to take over. They can discretely go abroad and "take care" of the pregnancy she is hiding from the world and they are more than happy to ignore the fact that Charlie's cousin Rose went missing during WWII. But Charlie suddenly realizes that she doesn't want her parent's money and prestige to take care of everything. She runs away instead, determined to find her beloved cousin and figure out what to do about her pregnancy. Along the way, she finds an unlikely and reticent ally in Eve Gardiner, a WWI spy with tremendous guilt about her past and a score to settle. The two women team up to find the man who might give them the answers they both need. Every time I go to write a historical fiction review set around this time period, I feel the need to state how much I love books set in this era. Many of them have dual narratives, where a contemporary descendant finds a letter or a diary and sets off to solve a mystery from the 1940s. In The Alice Network, Kate Quinn sets the present action right after WWII. This allows readers to see how little time passed between the two world wars and how devastating that was for the people who lived through them both. The two women in the story play against each other well as the pampered, sheltered rich girl and the older woman haunted by what she experienced. Charlie's wealthy family protected her from many of the horrors of war. Conversely, Eve was on the ground in France collecting information with the risk of being captured and killed around every corner. Through her, we see an honest portrayal of the toll of war--she becomes a drunk haunted by her past and unwilling to engage in the present. In the beginning of the story we are stunned by how angry and withdrawn she is but, as she reveals the story of her past, we understand how she got this way. Both storylines feel immediate because the horror of war is so recent and both women are looking for something that they can find in the present. It can by satisfying when a character solves a mystery from the past, but it has an even greater impact when there are repercussions in the present. 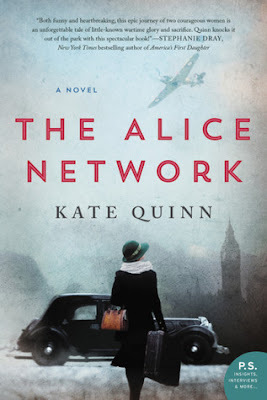 This is one of my favorite historical fiction novels that I've read this year and I will certainly be reading a story by Kate Quinn again soon. Me too! There are so many books in the genre that it can be frustrating to wade through the ok ones to find the wonderful ones.